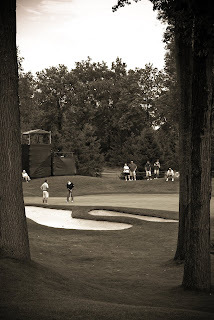 I had the opportunity to shoot a few pix at the Bridgestone Invitational in Akron, Ohio. It is part of the FedEx cup and the final day of practice was delayed by severe rain storms in the middle of the day. I was able to shoot a few hundred images before calling it a day. More images can be found on my web site. I give the pros that shoot golf a lot of credit. Ensuring the shutter doesn't fire until after the moment of contact is very challenging. I found this image interesting due to the way the trees framed the scene.